And enjoy it we did by exploring this amazing town. There are tourist double-decker buses and the quaint Disney-like train pictured above, but traveling like the locals either on foot on using local transportation is often more entertaining and it's certainly more economical. The Giro buses criss-cross the town and are colour co-ordinated (green, blue, red, burgundy and orange) according to their route. Each trip costs 1.40 Euro while an all-day ticket is 4 Euros. We've taken four routes so far and one thing we noticed almost immediately is that roundabouts in Albufeira are not just about function. Many feature sculptures that focus on Portuguese history or culture. 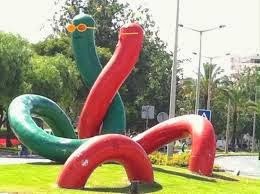 There is also a fun one known as 'the worms'. And another called the 'watches'. While we're now familiar with a good portion of the town we never tire of strolling around the old section. This is the main square where people stop to relax in the shade, chat with friends, or watch the children zip past on their skateboards or roller skates. Opposite the square are restaurants and stores to entice the tourists and I'm delighted to say we've never been hassled or harassed by shopkeepers. Their laid-back style makes window shopping a pleasure. Walking westward toward the marina we stopped to gaze at the awesome views of the coastline. If you look carefully you'll see the walkway down to the beach. Meanwhile, a group of 60 to 70 cyclists sped past, many saying hello or waving. A British couple who have spent the past ten winters in Albufeira told us this green building has been in that state of disrepair for as long as they can recall which is unusual because most are well cared for. With it's open windows, tattered drapes, broken tiles, weathered wood shutters and painted graffiti this building begs for a new and caring owner. Any takers? Or as in this case a more rustic and primitive approach. Doorways always fascinate. They're simple, functional, yet as unique as you or I.
Midway between the old town and the marina we spotted this walkway that offers an incredible view of the Atlantic Ocean. The person who lives in this home has a soft spot for cats. Notice the kibble on the tile beside the flower pot to the left of the door? Where there's easy, dependable food there will be felines. We spotted five sunning themselves on the terrace. This one reminded us of our beloved Juice. We'd also heard about the Castelo do Mar restaurant near the marina from the same British couple we met earlier. They mentioned it's a favourite with tourists and highly recommended it. It's situated on a hill overlooking the marina and ocean. To the left of the photo above, and around the curved road is a staircase up to the back of the restaurant. What makes it noteworthy is the huge cactus. As it was well past 2 PM we naturally stopped for lunch. The slow-roasted Iberian black pig with apple chutney, stuffing, Yorkshire pudding and fresh veg may not sound all that Portuguese, but it was certainly a hit with us and the other Brits and Europeans who came specifically for the Sunday Roast. We had an incredible meal with wine and excellent, friendly service. No wonder the Castelo do Mar received Tripadvisor's 2014 Award of Excellence. On our way back home I spotted a few things I'd missed earlier. Ornate, tiled street signs. Tiles niches on the outside of this home. Tiles that tell a story. Or share a homeowner's love of the sea. 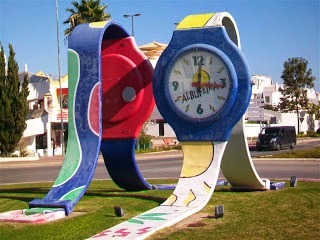 Albufeira is a town that appeals to all of the senses - including the tastebuds. We enjoyed every morel of this dessert earlier in the week. It's made of figs and is called 'Albufeira Delight'. We couldn't be more delighted with the town, it's gracious people, lovely climate or spectacular scenery. Albufeira truly is a delight.